The novel “Pack Animals” by Peter Anghelides was published for the first time in 2008. Halloween is coming while Gwen Cooper and her fiance Rhys Williams are making preparations for their wedding. However, the festive atmosphere gets spoiled by a series of strange attacks by Weevils and in some cases of other creatures that in turn attack them. Captain Jack Harkness’s team isn’t equipped for interventions on that scale and there’s a risk that the Cardiff population gets panicky while Torchwood drew the attention of a journalist. The members of the Torchwood team have their hands full trying to contain the attacks, prevent the news of the creatures that carried them out spread and figure out if there’s a thread behind it. Among the clues there’s the discovery of playing cards with monster images including Weevils and above all the apparitions of people who seem to be steps ahead of them with an ever-present name: Achenbrite. 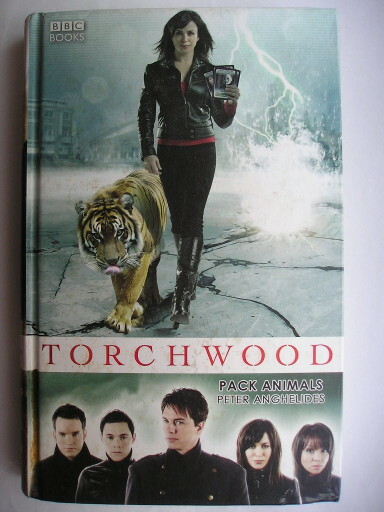 “Pack Animals” is part of a series of novels connected to the TV show “Torchwood“, a “Doctor Who” spinoff. The size is the same as “Doctor Who” books starting from the Eleventh Doctor. In the first books the font was smaller while in the following one the font is the same size as in “Doctor Who” books. “Pack Animals” is set in the period when Gwen and Rhys are preparing their wedding but as always happens in Torchwood stories the worst obstacles aren’t due to trivial problems but to violent events. In this case, these are large-scale attacks by Weevils and other creatures such as a kind of giant bat. From the beginning there are various complications that make Captain Jack Harkness and his team’s interventions more difficult. The plot is developed by telling the attacks of the various creatures and that’s used by the author to give space to all the protagonists. The relationship between Gwen and Rhys is important but there are also parts about that between Jack and Ianto and then some about Toshiko. In some ways Owen is a bit sacrificed but he also has his moments, also linked to the fact that the novel is set after his non-death. Around the members of the Torchwood team various narrative elements are developed that make the plot far more than a monster hunt. The presence of creatures such as a kind of giant bat is a strange thing, especially when the cards used in a game called MonstaQuest, popular among college students, also portray the monsters involved in the attacks. Another complication for the Torchwood team is in human obstacles such as journalist David Brigstocke, who seems to know too much about the organization, and above all about Achenbrite, a name that recurs during the investigation. Despite the limited length of the novels of this series, the author put several elements in the plot, my problem is in the way he managed them. In particular, I found the development of the plot too slow for over half of the book and then suddenly accelerates up to an ending which in my opinion is hurried. Most of the novel is focused on the members of the Torchwood team and their attempts to react to events while the characters linked to Achenbrite appear and disappear quickly. I think Peter Anghelides focused too much on the first part while I personally would have preferred him to develop further the one in which the characters linked to Achenbrite become protagonists too. I think a more balanced division of the story would’ve allowed to have a less hurried final. For me the protagonists spent too much time running around but for some readers that may be enough. If you’re OK with a story that’s mostly about Captain Jack Harkness and his team with the plot almost in the background then you might like “Pack Animals”.